Coach Richard Kelly,back row left, and members of the Hillview College cricket team, at the team practise session, at Honeymoon Park, Tunapuna, yesterday. DESPITE losing seven players from last season, Hillview players Kirstan Kallicharan, Leonardo Julien and captain Navin Bidaisee all believe the team is equipped with the talent to challenge for both the 50-over and T20 titles this season. Hillview are the defending PowerGen Secondary Schools Cricket League (SSCL) 50-over premier division champions and the PowerGen Intercol T20 champions. Seven players from Hillview's memorable 2018 campaign are no longer with the school including last year's captain Dexter Sween, Kareem Muradali and national youth players Keagan Simmons and Sachin Seecharan. The team will open its 2019 season against SSCL powerhouse Naparima College at the Queen's Park Oval in St Clair, on Tuesday, from 10 am. 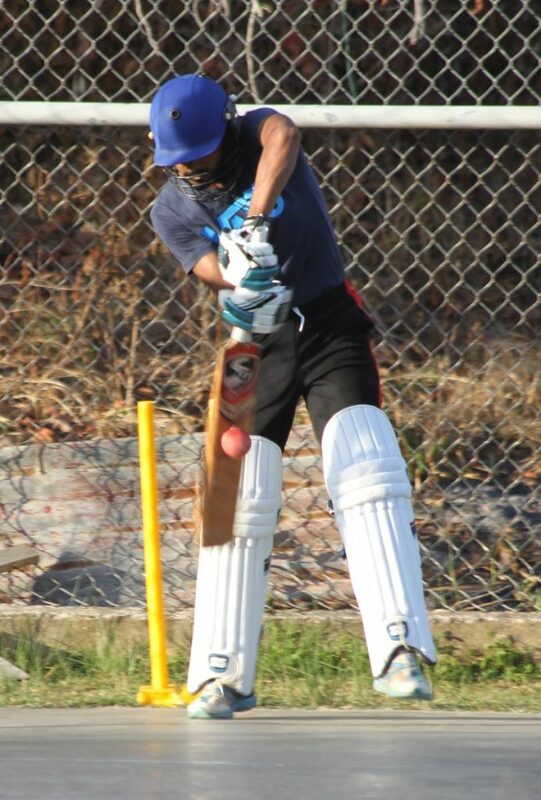 Hillview College’s Travin Mohan during a net session, at Honeymoon Park, Tunapuna, yesterday. 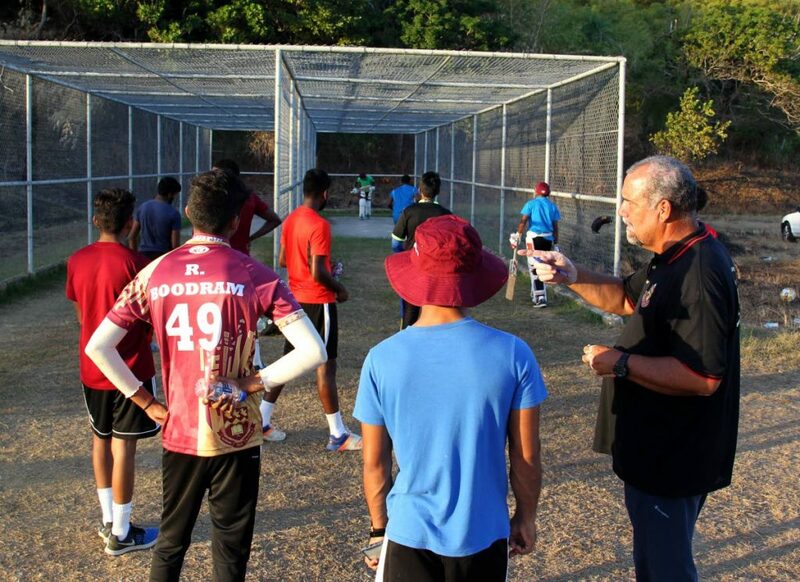 Yesterday, under the watchful eyes of coach Richard Kelly, the Hillview players were busy putting in their final preparations at Honeymoon Park in Tunapuna. Kallicharan was optimistic ahead of the season saying, "I think we have a great chance of winning this tournament (50-over) again for the third time. We did lose a few players last year but, we have some promising players for this year especially some young players coming up and we are looking forward to seeing them perform and doing their best." Kallicharan, who is a fan of Indian star batsman Virat Kohli, said Ronaldo Forrester, Bidaisee and Julien are some of the players he expects to lead Hillview this year. Hillview will also count on Kallicharan, a right-handed batsman, who bowls leg break and a former West Indies Under-19 player. Bidaisee, an opening left-handed batsman, who bowls leg break, says his team can play at a high level this season. "Definitely, I am still really confident. We have a lot of promising youth players coming up from Under-15 and Under-17 so we should be alright," Bidaisee said. Hillview College’s cricket coach Richard Kelly gives players some pointers at the team training session yesterday, at Honeymoon Park, Tunupuna. Bidaisee, who says former West Indian batsman Shivnarine Chanderpaul and Kohli are his role models, says Naparima will be one of the teams that will pose a challenge to Hillview. "As I said, Naps (would be a tough team) but, we are still not taking any team for granted because we playing each team as a good opposition." Naparima finished second to Hillview in both the 50-over and T20 competitions last year. Julien, a hard hitting wicketkeeper batsman who emulates former Australian wicketkeeper batsman Adam Gilchrist, says Hillview has what it takes to compete at a high level. "Hillview is an all-round team, but the batting is a little stronger than the bowling." Reply to "Hillview trio says team can deliver again"